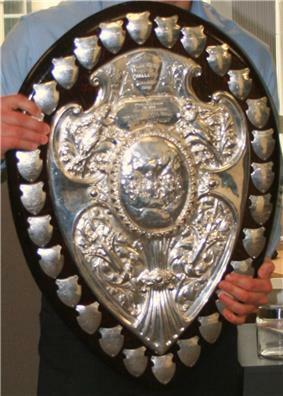 The Ranfurly Shield, colloquially known as the Log o' Wood, is a trophy in New Zealand's domestic rugby union competition. First played for in 1904, the Shield is based on a challenge system, rather than a league or knockout competition as with most football trophies. The holding union must defend the shield in challenge matches, and a successful challenger becomes the new holder of the Shield. Although the professional era of rugby has seen other competitions, such as the ITM Cup and Super Rugby, detracting from the pre-eminence of the Ranfurly Shield, many still regard it as the greatest prize in New Zealand domestic rugby. This is mainly due to its long history, the fact that every challenge is a sudden-death defence of the Shield, and that any team, no matter how lowly, has a chance to win. The Shield is currently held by Waikato, after beating Hawke's Bay on 9th October 2015 at McLean Park, Napier. In 1901 the Governor of New Zealand, the Earl of Ranfurly, announced that he would present a cup to the New Zealand Rugby Football Union to be used as the prize in a competition of their choosing. When the trophy, a shield, arrived, the NZRFU decided that it would be awarded to the union with the best record in the 1902 season, and thenceforth be the subject of a challenge system. Auckland, unbeaten in 1902, were presented with the shield. 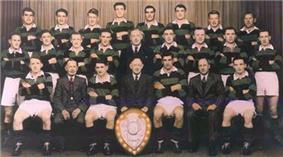 The shield was designed as a trophy for association football, not rugby. The picture in the centrepiece was a soccer one, and was modified by adding goal posts on the soccer goal in the picture to create a rugby scene. The alterations to the centrepiece are still apparent. Auckland were on tour in 1903 and did not play any home games, and thus did not have to defend the Shield. Their first defence was against Wellington in 1904, and was unsuccessful. Since the introduction of the National Provincial Championship in 1976, all home games a Shield-holder plays in the NPC or its successors, the ITM Cup and Heartland Championship, are automatically challenge matches. Auckland hold the record for the greatest number of consecutive Shield defences, 61 matches between 14 September 1985 and 18 September 1993. 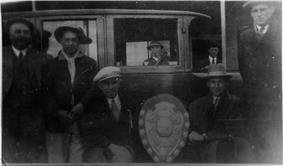 During this period Auckland took the Shield on tour to provincial unions that, mainly for financial reasons, would be unlikely to be able to mount a challenge for the trophy. While dismissed by some critics, usually because of the one-sided scores, it was mostly regarded as a success by those involved. In 1994 when Canterbury wrested the Shield from Waikato, it was in battered condition, with large cracks, chips and peeled varnish. Nearly a century of use had taken its toll. Canterbury player Chris England, skilled in woodwork, fully renovated it, bringing it back into pristine condition. The Shield holder at the end of each season is required to accept at least seven challenges for the following year. All home games during league play, but not during knockout playoffs, in the ITM Cup or Heartland Championship are automatic challenges. The remaining shield defences must be made up of challenges from unions in the other domestic competition. For example, since North Harbour, an Air New Zealand Cup (now ITM Cup) team, held the Shield at the end of the 2006 Cup season despite losing their home quarter-final to Otago, they were forced to defend the Shield against Heartland Championship teams during the 2007 pre-season. Having successfully done so, all their home fixtures in the round-robin phase were Shield defences until they lost the shield to Waikato. The Shield-holder is never forced to defend the Shield in an away match, although they may choose to, as Auckland, for example, did on a number of occasions during their record tenure between 1985 and 1993. More recently, Auckland played both their mandatory defences against Heartland teams in 2008 on the road. If a challenger successfully takes the Shield, all of their home matches for the rest of the season are defences of it. Once a team has successfully defended the Shield four times, all of the holder's subsequent matches in league play would be mandatory defences, whether home or away. The Shield will not be at stake in semifinals or finals. If an Air New Zealand Cup team holds the Shield at the end of the league season, that season's winners of the Meads Cup and Lochore Cup, the two trophies contested in the second-level Heartland Championship, will receive automatic challenges in the following year. The changes were not implemented, but did receive support from Auckland, which held the Shield when the NZRU released its report. * Current Ranfurly Shield holders as of 1 July 2016. Last updated: end of 2015 ITM Cup season. ^ According to Dunedin engraver Brian Swan, who noted the "very low" crossbar in the centrepiece scene, quoted in "Shield victory recalls origins of famous rugby trophy" by anonymous columnist 'Prester John' in Otago Daily Times, 2013-08-31, p35 (not published online). ^ "Auckland accepts two Ranfurly Shield challenges". ^ a b Fairfax NZ News (2013-09-01). "Hawke's Bay claim Ranfurly Shield glory". Stuff.co.nz. Retrieved 2013-09-01.